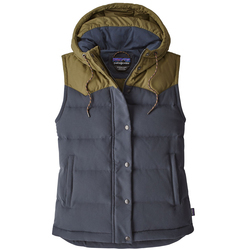 Down provides an exemplary heat-to-weight ratio, making it an incomparable vest insulation material. 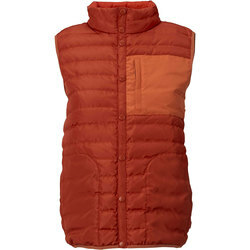 Down vests provide magnificent core warmth, while remaining extremely lightweight and compressible. 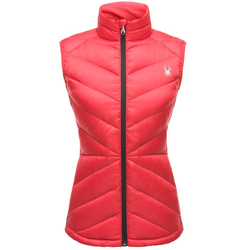 Modern women's down vests come in a variety of styles. They may have flattering angled baffles, stylish asymmetrical quilting or more traditional horizontal baffles. Vests are also supremely versatile, because you can wear them over layers of different densities and unzip them when you get warm. They are an outstanding addition to just about any activity, whether you are hiking, running, walking the dog, biking or simply running errands during cold winter weather. 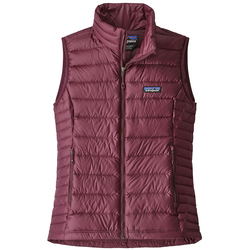 Premiere down vest brands for women include Marmot, Mountain Hardwear, The North Face, Patagonia and Obermeyer.